Take Verbesina virginica, it's a rather rough and tumble looking white flower with a petal here and a petal there, but, that matters not to a bee. They're in it for the nectar and pollen payoff and this asteraceae family member has quite a payoff. Wasps, bees, beetles, butterflies, skippers, and flies all adore it. Flowers need to pack more than beauty to be invited to have a big presence in my garden. Blooming along with Frostweed are several other flowers that fit that big bill! Ironweed and Cup Plant also have stature, beauty and substance. 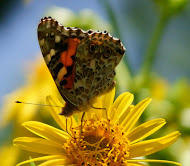 They're both pollen and nectar producers for bees, moths, skippers, butterflies, flies, etc, and bloom for a long time. Cup Plant seeds are attractive to Goldfinches and they've been known to drink from the water captured in the cupped leaves. an under-appreciated native wildflower or a ditch weed? I have a special place in my heart for these wild and rough looking beauties that are usually found growing in meadows, prairies and roadside ditches. That's their pedigree~purebred by nature. I really like plants that haven't had their best characteristics bred out of them. Silphium perfoliatum, Vernonia altissima and Verbesina virginica are three plants that have no cultivars. Which means they have not been crossed or genetically altered by human hand to be shorter, more floriferous, double flowered, disease resistant, sterile or what ever else is the going fad. After all, how do you improve on perfect? They're beautiful, they're doing the job nature intended them to do~Make a lot of nectar and pollen and bloom for a long time, exactly when the critters need both. Perhaps, this would be a good time to remind you that if you want to attract pollinators you must never, ever, ever, ever use pesticides in your garden. I am sure I saw ironweed growing by a stream on yesterday's walk. You are right, how can one improve on perfection. Just where it's happiest~near water! I've been on the hunt for Vernonia since I saw it growing at the Royal Botanical Gardens in their wildflower/native garden. I can't think of a better colour of purple - the size is impressive, the blossoms and stems move with the wind, and the pollinators act like 10 year old girls at a Justin Bieber concert when they find it. Gail, do you do your wildflowers from seed, or small plants? Barbara, the originals were plants, but, they have sown themselves about...Can I send seeds to Canada? Email me! Insects have different beauty standards, and we also have been judging their beauties. It seem like the black swallowtails emerge almost at the same time in the US as most of the blogs i read with butterflies are mostly those black swallowtails. I wonder if they are really big, or just cropped to be big. I love them, because i most of the time cannot shoot their cousins here with clear forewings. Andrea, they really can be nice sized critters with a 3 to 6 inch wingspan and they can move terribly fast. Sometimes I stand there quietly waiting for them to not notice me before I can get a decent shot. At this time of year, I remind myself often that the pollinators don't care how manky the foliage is, or if the blooms are ragged! Manky is a good word for how my garden starts to look around about now! Love Ironweed, that color is one of my favorites!! I will have to get some ironweed for my garden. I don't see it anywhere, and it should be happy here, I think. Now I know I can send you seeds! Gail, I have seen all of these blooming around our area too. I just love em. Great photos. No one can perfect perfection of Nature! When Humans interfere, perfection is no longer perfect... I am guilty as the next, as I want my woods to be tidy and the way I think they should be. That is not the way it should be though. Sigh…. i adore ironweed. they surround our farm in the tall uncut fields and i anticipate when they arrive. what would be the best way do you think? to bring them into my garden? i would love to have them right next to me. i was just thinking this morning i need to photograph the fields surrounding us. Hi, Gail, I just learned this lesson. I was about to "deadhead" a buddleia past its prime, and a hummingbird swept in and helped herself. And I said, "OK, then. Just because it didn't look perfect to me, it suited you just fine!" So I'm waiting much longer to deadhead anything. If it has flowers at the wee end, so be it. A hummingbird--or a bee--simply doesn't care. It's food. Your pics are beautiful. Such wisdom, Gail! These words should be engraved in gold, embroidered in silk and tattooed on the foreheads of those who would mess with perfection! I love your pictures and gardening style, as always! This is a great post for me... thanks! This year I have seedlings of cup plant and ironweed getting established. I look forward to these doing well and attracting some great insect wildlife in the years ahead. Your photos are so encouraging! They may not be in it for the beauty, but all of the plants in your photographs are simply beautiful! 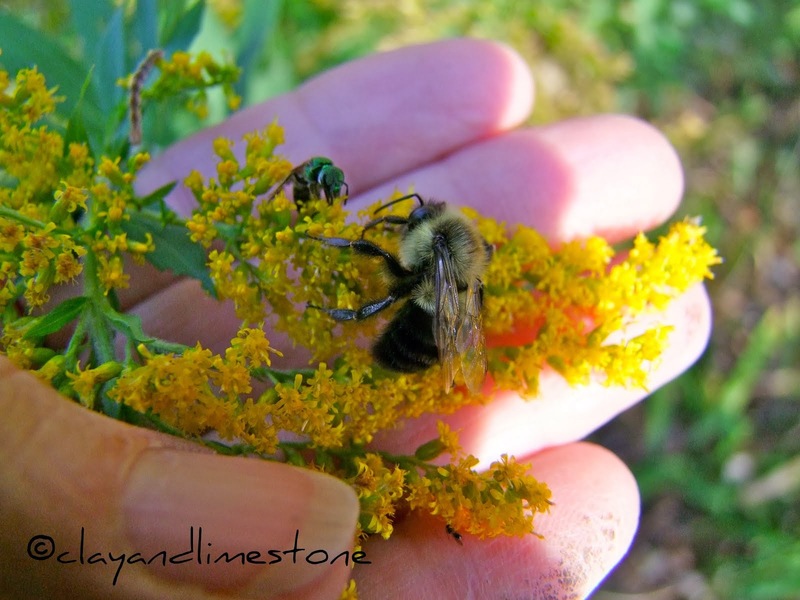 As are the bee pics -- they make me smile, just thinking about them buzzing around in the sun of your garden. I so enjoy your blogs! This past year I have made a very diligent effort to ID as many plants as I can in our woods. We've lived here 4 years but didn't know the names of most of flora. It has been pure delight to discover spicebush, pawpaw, Ox-eye, Great Blue lobelia, silvery spleenwort, ebony spleenwort, Bottlebrush grass, wingstem, shrubby Saint-John's-wort, and ironweed. All in their natural forms. And it has been fun to see what insects and birds are visiting the plants. I look forward to your blogs because I learn so much more and then enjoy the hunt to see if we, too, have that plant here in our woods in south-east Indiana. Love, love, love your photos and wisdom. I guess beauty really is in the eyes of the beholder. I'm like the bees... I think they're all beautiful! I admire those busy bees. Impressive close up photos. Awesome! Very good points, Gail. I like the wild ones, too. Great photos! It seems to me I have never seen so many pollinators as I have this year. Bees and such, of course, but LOTS of butterflies. My eyes don't work fast enough to identify most of them. Beautiful captures of so many pollinators, Gail! I've noticed, too, that the bees and other insects are as attracted to the native weeds/wildflowers growing out in the "back forty," as I call it as any plant in my garden. I need to plant some ironweed! Gail, it's always amazing if you're lucky enough to capture butterflies in their element - as you have done with some great photos. We have an apiary and I cringe when I see people spraying, it really is so unnecessary in the home garden.